Delayed closures are VERY common in the Shih Tzu. Most so called "hernias" are actually delayed closure of the umbilical or inguinal (groin) area. We call it a hernia, because at that time, that seems like what it is. Sometimes I do not mention on my website if a puppy has a inguinal or a umbilical hernia at first because most of the time it is actually already closed by the time they go home. If small, sometimes they are closed by 8-12 weeks. If It seems as if it won't be closed when the puppy is old enough to go home, I feel it is important for you to know. You really can not tell the difference between a true hernia or a delayed closure unless the hernia is severe, but if as the puppy gets older and the hernia is getting better as he/she grows, then most likely you are just dealing with a delayed closure. Sometimes a breeder just simply knows based on experience that a particular dog has puppies that just simply are a little slower at closing up...that being said most breeders will not continue to breed a dog that has continually throw true inguinal hernias. It is not uncommon for a umbilical Hernia not to close, almost all are simply cosmetic and do not cause any health concern what so ever, but can be stitched close for very minimal cost at the time of spay/neuter if desired. Almost all "inguinal hernias" are simply delayed closures and require no medical help. True inguinal hernias are actually rare in shih Tzu's. Almost all so called inguinal hernias (actually delayed closures) are completely healed by 4-6 mos of age. I believe delayed closures are very common in the shih tzu and even though I have had delayed closures I rarely get a true inguinal hernia that I feel will need to be surgically repaired. If I believe they will need to be repaired I will let you know before the puppy is purchased. Umbilical hernias really are of little concern and are very common in the Shih Tzu breed. They usually show up at around 2-5 weeks of age and some of them will close on their own by around 6 mos of age (delayed closure). If it is large enough that it is "in the way" then it probably should be closed up when the puppy is spayed/neutered if it hasn't closed on it's own, very large hernias should always be closed up so the muscle doesn't close up around it and cause internal injury (however this is very rare to have a umbilical hernia that is large enough to become strangulated). A lot of Vets will do it free of charge or for a small fee as long as they are already spaying or neutering the dog. An umbilical hernia is usually a small soft bump where your puppies umbilical cord was (their belly button) and for whatever reason the muscle failed to close up. 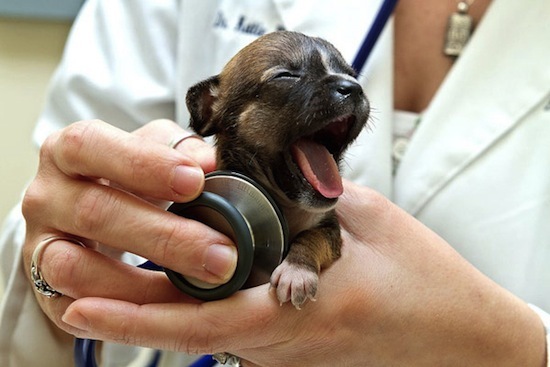 There are a couple of reasons why a puppy gets an umbilical hernia. Because of a shih tzu's uneven bite, sometimes the moms tend to have a harder time "cutting the cord" and will tug, pull or even chew to close to the skin or sometimes a difficult delivery and the puppy had to be pulled out. Most breeders will not allow the mom to chew the cord as to prevent a hernia. If you get hernias consistently from the same dog and the breeder has cut the cords and not allowed the mom to chew them, then this is most likely inherited (but could be from the mom or dad or the combination of both) Sometimes they just simply pop up out of no where. Very very rarely is an umbilical hernia any health concern what so ever. They are quite common in the Shih Tzu and are easily fixed if so desired. You can not tell if a puppy has a true hernia until they are at least 5-6 mos old. They are almost always just delayed closures. An inguinal hernia is the result of abdominal organs, fat or tissue protruding through the inguinal ring. Inguinal hernias are skin-covered bulges in the groin area. They can be bilateral, involving both sides, and unilateral, involving only one side. Inguinal hernias are more common in females than males, but do occur in both sexes. Most all inguinal hernias will shrink and disappear as the puppy grows, although you must keep an eye on the size of the hernia. I recommend you push the tissue back into the cavity a couple of times a day or whenever you notice it "sticking out" (if it is on the larger side). Small Inguinal hernias are of little concern and do generally close up on their own. As with an umbilical hernia, if it hasn't not closed up on it's own by the time it is time to spay or neuter your puppy, then I recommend to have a vet close it up at that time. Very Small inguinal hernia's usually would be fine if left, but I recommend to play it safe and just have it fixed when the puppy is spay/neutered if you are at all concerned about it. Large inguinal hernias if ignored could potentially cause a health concern for the dog if the muscles closes up around the hernia and strangles it. However this would not happen if you are pushing in the bump and you get it corrected if it is still present by 6 mos of age. Inguinal Hernias can be a big deal to a breeder as a female that has had an inguinal hernia that didn't close on it's own should never be bred as that area will be weak and could potential be a major health risk when whelping puppies. However, again, true inguinal hernias are rare in the Shih Tzu. Quick note on repairing hernias: Some breeders will have hernias repaired before going to their new home when the puppy is young. This may sound very good and I am sure the breeders mean well, however..... after consulting my veterinarian and based on my own opinion and views......... a surgery on any puppy less than 4-5 mos old (actually any age for that matter) is very risky. I do not think it is a good idea nor very safe to have a young puppies hernia repaired before going to their new home (unless it is a life threatening situation). Since most all inguinal are not true hernia's they heal on their own, there is no sense in risking the health of a puppy on an unnecessary surgery or having to have two surgeries when it could be done with just the one surgery at the time of their spay/neuter. Tight nostrils are very VERY common in the Shih Tzu breed. A lot of people think that tight nostrils and Stenotic Nares (pinched nostrils) are the same thing. In reality they are very very different. Tight Nostils will generally come on when the puppy is teething and sometimes not go away until the adult teeth have fully come in (even up to a year old). Sometimes it will come and go as the puppies gums are swelling off and on from the teething process. Some puppies can't hardly breath out of their noses at all during this time, but as long as they are active and eating and drinking normally it is of little concern. Never have surgery done on a puppy that just simply has tight nostrils as it will eventually go away. Some dogs will have tighter nostrils than others and some will snore and snort more than others during their entire life, but tight nostrils to the point that they can't breath through their noses and cause health concerns will generally go away with time. Stenotic Nares on the other hand are completely different and are present at birth. From the time the baby is born he has difficulty breathing through his nose and struggles with nursing from early on due to the inability to breath and eat at the same time (this can happen with tight nostrils also, however the pup is generally almost weaned by this time). Some of the time (but not always) surgery will need to be done on Stenotic Nares as the puppy may always have this issue and over time could cause other health concerns. However, even with Stenotic Nares the puppy can outgrow the condition. If the puppies Stenotic Nares are so severe that they can not breath at all or very very little through their nose, and it is obviously causing lethargic behavior or other health concerns, then I would say surgery would probably be needed, however if a puppy can breath through the nose enough to lead a normal life (except for maybe a lot of snorting and snoring :) ) Then I would wait to have surgery done until the puppy is over a year old as it is a possibility as they mature that they could outgrow the condition. Some Vets are way to eager to perform surgery, when it may not be needed, however I am not a Vet and you should never take my advice over a vet unless you yourself chooses to do so (just my disclaimer). There is one Condition that I believe is quite common, yet a lot of breeders do not know about it or realize their puppies have it. I feel strongly people should be educated about it. They are called Prapso puppies, I am attaching an article I wrote concerning this interesting phenomenon. Prapso’s are not uncommon. The problem is a lot of breeders do not know about this condition and as a result does not recognize the signs. Reputable breeders that are aware of this will simply sell the Prapso as a pet and educate potential buyers about how their puppy will be different. However, some not so reputable breeders know exactly what a Prapso puppy is and choose not to tell buyers that the particular puppy they are interested in is a Prapso. A buyer can and usually will be very confused and disappointed in their puppy if they are not educated about this condition. If the buyer is looking for a show-quality Shih Tzu, the puppy or dog could then suffer from the results of a disappointed buyer, he could wind up in a shelter or worse homeless. A loving pet owner could spend unnecessary time and money and mental anguish trying to figure out what is “wrong” with their puppy . The Prapso puppy makes an absolutely wonderful, smart, affectionate, playful, somewhat low maintenance alternative to their breed standard counterparts. People that have owned Prapso’s are known to ask for another one as they realize what a joy they really are. The Prapso puppy is nothing to be ashamed of. On the breeder side of things, obviously, most breeders do not produce a Prapso puppy on purpose. They can just “pop up” every once in a while and no one really knows why. There are a lot of breeders that have had a litter or more with a Prapso puppy. There are theories that the Tibetan spaniel was mixed into the Lhasa and Shih Tzu breed many many years ago in Tibet, and they are the result of this practice. Some people just believe it is a genetic mutation that for whatever reason results in this characteristic. Regardless, it is not recommended to pull a dog that has produced a Prapso out of a breeding program, however it is advised that the particular breeding not be duplicated. A female that produces Prapso’s is very limited in the amount of puppies she can produce and because of this should just be bred to a different male, because more than likely she wouldn’t produce a Prapso puppy when bred to a different male. A male that produces Prapso puppies should be handled a little more careful as obviously they can produce many many offspring. Litters that a male produces should be closely tracked and bred carefully. There are those breeders that have actually got requests for another Prapso and therefore have purposely produced Prapso’s. This has been seen mostly with the full Lhasa Prapso’s as you get the temperament of the Lhasa, without the hassle of all the hair. This would generally be frowned upon with most show breeders, however most breeders each have their own reasons as to why they breed and what their goals are for their programs. The first picture I found on the internet on a "rip off report" this poor buyer is sure they didn't get a pure bred shih Tzu due to his "different look". I would bet $1,000,000 this sweet baby is absolutely pure bred, however......he/she is a FULL Prapso puppy and has an obviously different look due to his short smooth coat. It give his/her face the appearance of a longer snout (which he may or may not have), because of the short hair. If this is your photo and you do not approve of me using it please feel free to email me as I couldn't find an owner to get permission, but was a wonderful example of this condition. This breeder should have informed this buyer of the hair difference on their baby to avoid any unnecessary heart ache. He/she is very cute, but obviously has a different look. I am not able to breed her because of the Prapso condition and have given her to my sweet Aunt who Minnie is currently enjoying living with in the country chasing my Aunts cows and horses! LOL You can for sure tell the difference between the two in my picture. Nala - The cream long haired one and Minnie the black one being the Prapso Shih Tzu. For more information about this condition please feel free to email or call me. An open Fontanel is the puppies soft spot on the top of the head. Typically soft spots close by the time the puppy reaches 2-3 months of age and some close right away. Sometimes you will have a puppy that the skull never quite closes all the way or takes a little longer. This is usually of little concern and can be very common in the smaller/imperial Shih Tzu's. If the soft spot is unusually large and never heals over then you do have to be careful with the puppies head, just like a newborn baby. It isn't common that a soft spot is large enough to cause a concern. If it is so large that extra caution has to be taken then you need to look at other health concerns that could cause the opening to be extra large. This is a condition in which the patella/knee dislocates. The luxating Patella under most circumstances often has no or very mild symptoms. Luxating Patella can and does happen periodically in the smaller breeds, but is generally mild. Not all luxating Patella needs medical intervention. Luxating Patella has different grades. Grades 1-2 is considered very mild and the puppy could very likely grow out it or will cause no long term effects or complications (this is most common). 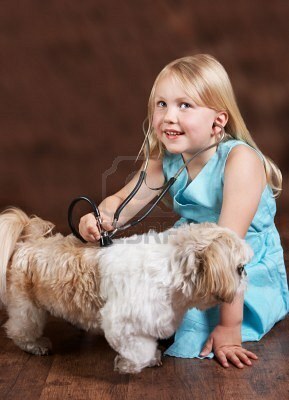 Grades 3-4 Should probably be addressed by a veterinarian. They could potentially be more serious and need medical intervention and could potentially cause more long term damage and pain for the adult dog. Most information pulled from my friend and fellow Shih Tzu breeder Rael's website.